The 2015 WRAP Around the World Conference is only days away! This year’s keynote will be addressing what each us can do in our day to day relationships through peer support, receiving support from others and supporting others, that will help enhance the power and effectiveness of WRAP. In anticipation of Monday’s conference kickoff, I wanted to share the following keynote address from a recent conference that speaks to the Power of WRAP. When I talked with you at the conference back in August of 2011, I spoke a lot about the pendulum. At one end of the pendulum the recovery movement is moving forward; more and more people are using WRAP and the Key Concepts and following the Values and Ethics – and recovery is becoming possible and probable for more and more people. And I also said that we have to be ever mindful, that something could happen so the pendulum could once again swing in the opposite direction, and we could find ourselves enmeshed in a regressive, oppressive and punitive system that shackles people for life, and too often takes their life. 3. The continuing efforts to wrongly convince people that harmful medications and treatments are the answer to mental health issues; to hide the truth that Bob Whitaker has uncovered, rather than tell people the truth and teach them about self-help and WRAP and recovery- about safe and non-invasive ways they can recover and move on. So before I talk with you a bit about WRAP, and review with you a small sampling of our major accomplishments, I want to bring your attention to each of these issues. Each of you will need to respond in your own way, in whatever way you can. Some of you will speak out loudly, and like David Oakes, become activists, and others will show the way by supporting their peers and taking good care of themselves. There is no right or wrong way. Only you can decide which path to take, or if you will actually take both paths. I expect there are many people in this room who will take both paths. First , Sandy Hook. Everyone, especially the politicians are looking for someone to blame. And it seems that we, those of us who have had or have mental health issues, have a strong chance of becoming the scapegoats they are looking for, in deference to the real action that our government needs to take. Everyone is at risk here. If these efforts are allowed to continue, we could see more and more forced and harmful treatment, more people being “locked up” for nothing more than being “different”, more and more kids and young adults “tested”, determined to be in danger of becoming “mentally ill” and therefore a danger to society, being treated and drugged, resulting in the harmful effects we already know about. If we reach out for help, our rights to privacy will be violated and we will become part of proposed databases that are accessible to anyone. Each of us needs to protest nonviolently to protect our civil and human rights. As they start pouring money into mental health services thinking that this is going to stop the gun violence, we need to insist that this is peer driven mental health services that include WRAP, and is not the same old top down diagnosis and medication that has not ever worked for us. 2. As has been the case for as far back in history as we know it, there continue to be human rights violations in the mental health system. We all know that seclusion and restraint are not treatments, in fact they are very, very harmful. Strip searches further traumatize people who are already struggling. At this year’s Alternatives Conference, I led a seminar of about 70 people to try and get a handle on the extent of these and other violations in the mental health system, and to figure out what we could do about it. I was astounded by what I heard. Those sessions were incredible. It is hard to imagine what people have had to endure in the name of “help”. The Copeland Center wrote a white paper regarding these issues. It is available on line. [see link below] In addition, we have a committee that is looking into developing an intensive curriculum that would teach people how to be leaders in the fight to end this abuse. Gina Calhoun and other Advanced Level WRAP Facilitators are doing what they can to change the culture in state hospitals and other facilities to end abuse, and to promote recovery initiatives, in particular WRAP. Your best defense against abuse from the system is to keep yourself as well as possible, to take responsibility for your wellness, and to support others in doing the same. 3. I know that many of you have been taking psychiatric medications for many years and are stunned to hear Bob Whitaker’s findings. You may be feeling that you took medications unnecessarily for many years, medications that have compromised your health and your life–that these medications that were supposed to help you feel better have in fact made you feel worse – exacerbated the symptoms they were supposed to relieve. At the same time you are hearing that it is difficult to get off of these medications, and that getting off of the medications may cause you to feel worse – much worse for a while. You will be interested to know that a number of psychiatrists have come to me apologizing for what they have done. It is preposterous to me that we continue to see advertisements for these medications everywhere. They should be banned. Big Pharma has so much money so this is a hard fight. Anyone who has been deeply despondent or living with anxiety will be affected by those perky ads that make you think everything will easily be OK if you take the drugs. So those are the three issues, REPEAT as I see it right now, that they are trying as hard as they can to move that pendulum to the wrong side. Another visualization I had is a game of Tug O’ War. On one end of the rope is all of us, pulling and pulling and pulling. And on the other is big Pharma, and some of the politicians, and lots of $$$ signs and anyone else you want to put on there. It is quite a tug. And it is on-going. But we must win with our people power. 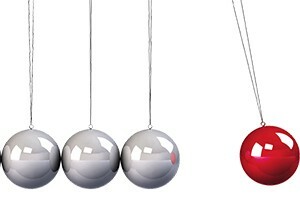 One of the things that is going to increase the power on our side of the rope if you will, and keep the pendulum from swinging in the wrong direction, is WRAP. Anyone can use WRAP. And it doesn’t cost anything. And you can use it on your own or, if you choose, as part of the system. One message I want to get out to you loud and clear. I know lots of you are WRAP facilitators or Advanced Level WRAP Facilitators. Others of you administer WRAP programs. This part of my message is for all of you. But if you are a WRAP user, listen up as well, because you need to know this too. WRAP is an Evidence-based practice. That means it has been intensively studied and has been proven to work. Over and over again. It has gone through the rigorous process that allowed it to be listed as an Evidence-based practice. Therefore, if you are sharing it with others in any capacity, you need to share it CORRECTLY. Everyone who has mental health issues or who wants to develop a WRAP has a right to know the version of WRAP that was studied. Then if they want to change it for their own use, they can. But you have a responsibility to share the version that we know works. It is interesting to me that when I talk to people about what WRAP is, even though it seems very clear and straightforward to me—and always has been to the people who developed WRAP, I get various answers. Some of the responses have different parts of WRAP, they have them in different order, they have them with different names, some of the absolutely critical parts of WRAP are even omitted. Some people have received training that they thought was WRAP training or WRAP facilitator training, training that had been shortened or that was not led by people who knew about WRAP or who had had their skills updated. They were using materials that were way out of date, or that had parts or whole sections left out. But there is only one true WRAP. And that is the one that has been studied intensively now, and that we know works. It has been proven conclusively, in numerous large, intensive and rigorous research projects, that WRAP—as described in the WRAP materials I have developed, that you can easily follow in Section 4 of the Facilitator Manual — gives a step by step guide; helps people who are dealing with mental health issues and all kinds of life issues to get well, stay well and move on with their lives – even people who have had the most serious and extreme challenges, people who have been institutionalized for many years, people who are living on the streets, people who live with things like horrific anxiety, depression, delusions, people who have experienced unthinkable trauma. When these people who have suffered so long get introduced to WRAP, they deserve to be introduced to the “right” WRAP, the evidence-based WRAP, the WRAP we know works-not some abbreviated variation of WRAP. They deserve the best there is. Just a short review of some of the key elements. When WRAP is taught in WRAP groups, the facilitator first leads the group through the process of developing a group agreement, a safety contract or comfort agreement to make sure that in this group of up to 12 people, everyone agrees to follow group developed guidelines that insure every single person feels safe in the group, including the facilitators. This is absolutely essential. Without this safeguard, groups can be a dismal failure, or worse further traumatize people and lead them away from WRAP. 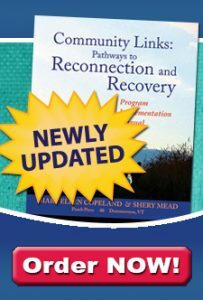 WRAP groups begin with an introduction to the Key Recovery Concepts— hope, personal responsibility, education, self- advocacy and support— the concepts that I discovered when I first began studying this issue and which have stood the test of time. The parts of the evidence-based WRAP are: The Wellness Toolbox, Daily Maintenance List, Triggers and an Action Plan, Early Warning Signs and an Action Plan, When Things are Breaking Down and an Action Plan, Crisis Plan or Advance Directive, Post Crisis Plan. Those are the parts of WRAP. No exceptions. No changes. These are the parts that were defined by the group in Bradford, Vermont 15 years ago, with the later addition of the Post Crisis Plan. To insure the best outcomes, it is critical that the group facilitators and participants adhere to the WRAP Values and Ethics. – Support, Self-determination, personal responsibility, empowerment, and self-advocacy. – It is always voluntary. – Everyone is treated as an equal, with dignity, compassion, mutual respect, and unconditional high regard; as a unique, special individual, including acceptance of diversity with relation to culture, ethnicity, language, religion, race, gender, age, disability, sexual identity, and “readiness” issues, and treat others the same way. – Based on the premise that there are no limits to recovery. – The person developing the WRAP is the expert on themselves. – Concentrates on individual strengths and away from perceived deficits. – Avoids the use of clinical, medical, and diagnostic language. – Emphasizes strategies that are simple and safe. When people are introduced to WRAP in a standard WRAP group, it is led by two trained WRAP facilitators—facilitators who were trained by Advanced Level WRAP facilitators who have, through the Copeland Center for Wellness and Recovery, kept their skills up to-date. WRAP has spread from the US to England, Ireland, Scotland, the Netherlands, and on to places like Hong Kong , Australia, New Zealand, Canada, Japan – and to every one of the 50 United States. WRAP has truly spread around the globe, and it continues to be spread each and every day. It continues to spread, even as all of us are gathered here for enrichment and support, and to figure out how we can further promote the spread of WRAP. WRAP has done what we had been told over and over could not be done. “They” said that no one could ever recover from what they call “mental illness”. But we have shown them that it is not true. We have shown them that we can and do recover. We have shown them that we can and do go on to do the things we want to do with our lives. Someone once said to me, the best defense is to do very well. So I urge all of you to – do very well. To live WRAP. Do it right. That is exactly what has happened. A small group of dedicated individuals, people who saw the power of WRAP, have worked tirelessly for 15 years now, and have brought in hundreds and thousands of people along the way to do everything they could to insure that anyone who could benefit from WRAP had access to it, and instruction in how to develop and use WRAP— now purported to be, by far, the most widely used mental health self help program in the world— in fact there are not any others that are even in the running. WRAP is a bit of genius that came out of a small group of people who were struggling to survive 15 years ago. And look where we are now. We have indeed changed the world. Let me share with you some of the incredible accomplishments of the Copeland Center and the WRAP movement and some quotes from people who use WRAP. When this work began to gather momentum, and I realized how valuable it is and what an impact it can have on people’s live, I wanted to insure its continuity beyond me. So in 2005, we set up the not for profit Copeland Center for Wellness and Recovery to take responsibility for the training. Since that time the Copeland Center has grown and grown and grown. It now sends trainers all over the world to train WRAP facilitators and Advanced Level Facilitators and to consult about integrating WRAP into mental health systems. We now have over 300 Advanced Level Facilitators–people who teach others to be WRAP group facilitators– and 5,000 WRAP facilitators. Incredible. I never could have imagined it could be so successful. Special thanks to Matthew Federici, Katie Wilson, Gina Calhoun, Elaine Stiles, the Copeland Center Board of Directors and all the Advanced Level WRAP Facilitators for carrying my vision to the world. The Copeland Center hosts training events everywhere, and we set some up so people come to us. I love it when we hold training in my community, Brattleboro, so I can meet with the attendees. We never cease to be surprised at the integration of WRAP around the globe. And now, a dream of mine has been realized. Beginning at this conference, The Copeland Center is a membership organization so every one of you can be a part of the action. That is the way it was always meant to be. You are the Copeland Center. Join here at the conference and be a founding member. This is thanks to the generosity of a donor who funded the set up of the systems that allow us to have members. This year the Copeland Center will be designating agencies as WRAP Centers of Excellence. In order to become a WRAP Center of Excellence, the organization has to meet an extensive list of criteria. The first organization to attain that status is P.E.E.R.S. here in Oakland. Special thanks to them for their hard work on this conference. However there is a long list of organizations who have applied for this designation, and even more who are working and preparing for the application process. Ed and I, with the able assistance of Magdaline Volaitis, Anne Reed and Natalie Gurmoth, are responsible for the publication process known as WRAP and Recovery Books. We ship mountains of WRAP resources to people who are leading WRAP groups in prisons and jails, in the VA, in short and long term care units, in state institutions, in medical hospitals, in group homes, in faith based organizations, to local, regional, state and national mental health agencies and organizations, to elementary schools, high schools, colleges, graduate schools–to psychiatrists and psychologists and case managers, and counselors and teachers— to communities of people and to individuals and family groups — to all kinds of businesses and corporations— to countries on every continent. Glyn Butcher in Great Britain does a great job of keeping us informed of his activities. Wali Mutazammil through his connections internationally has been developing relationships and pioneering to bring WRAP to the people of Ghana. Jeanie Whitecraft of Philadelphia who has been a continuous and tireless advocate for many, many years. Jo Halligan introduced WRAP in Guam. BJ North brings WRAP to the organizational level as a tool for strengthening the workforce to be grounded in the values and ethics. Gina Calhoun, strengthening WRAP in State Hospital settings across Pennsylvania, Oregon, and Georgia Hospitals. Jun Jun in Japan supported the Copeland Center in conducting the first Advanced Level WRAP Facilitator training, giving Japan capacity to sustain the WRAP community there. Sania Yau, executive Director of New Life Psychiatric Association in Hong Kong has pioneered the introduction of WRAP and Peer Support Services throughout the organization in Hong Kong. Sania has developed a team of WRAP Facilitators in Hong Kong and recently, two Advanced Level WRAP Facilitators through her organization, as well as advocating and implementing the use of a Peer Support workforce in Hong Kong and China. I want to end with a couple of short stories. As I was thinking about what to say in this keynote, I did a little “channeling”. I don’t know if you believe in that sort of thing, but I spent a few minutes channeling my mother Kate. Many of you have read her story. If she had lived, she would have just turned 101. This is what I got when I settled in and listened; “Tell them to eat right, she said.” And then she said, “Support. There was this fella who came by and encouraged me to talk. So I talked. And then I thought I was saying too much, but he said no, keep talking. So I did. I didn’t have anything to lose at that point–I had been locked up for 8 years. And then a nurse, Mrs. Hoffman, started doing the same thing. Encouraging me to talk. She even took me home with her a few times. I talked myself right out of that place. After that if I wasn’t talking I was listening. Every morning at 7 am I called Mary and she listened. (I think it got her going for the day) And she talked some. You have to dig yourself out of this yourself. If you get help, good. But you are the one who is going to have to do it. ” And that is from Kate. So I will leave you with that.